FriendlyPoster allows you to order a poster with the profile pictures of all your Facebook friends on it. To do this you simply need to click here and enter your Facebook login details. 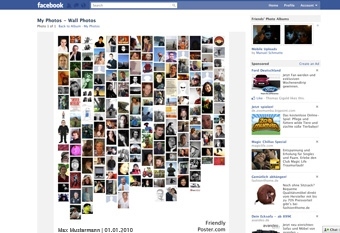 Then you pay quick and easy via PayPal and a few days later you can put all your Facebook friends on your wall. What exactly happens to my Facebook data? We only use Facebook Connect to create a list of the profile pictures of your friends. We then print the publicly available profile pictures of your friends on to your FriendlyPoster. We neither forward your data nor do we store any further data. I want to give a FriendlyPoster away, are there gift certificates? Yes, only here you can buy a gift certificate for the price of a poster, including shipping. Only a few seconds after your payment you'll get a code sent to your e-mail address, which you can give away immediately. The recipient can then redeem the coupon here on FriendlyPoster.com and print at no additional cost a poster of his/her Facebook friends. How long does it take to get the posters get? Our production time for the poster is approximately 3 business days. Your poster will usually ship within 1-2 business days of completing your order. All shipments are made using DHL. What address is my FriendlyPoster shipped to? We will ship your poster to the registered address at PayPal. To avoid returned packages, please ensure that your shipping address is up-to-date and correct when filling out your personal information. Shipping is only available within the European Union. A propos, yummly is using yumm.ly (via bit.ly).